Oswego County BOCES students in Maureen Bennett’s class at Fourth Street School held an Art, Science and Ice Cream Social for family and friends. Brandon Witkovsky holds his energy presentation. They showcased some of the many projects they have worked on during the school year. 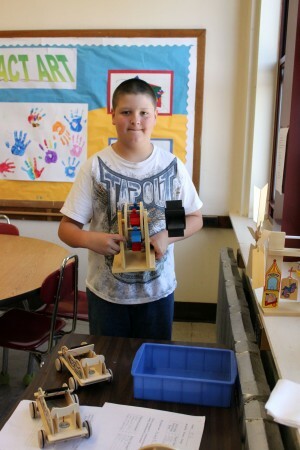 Exhibits of paper airplanes, abstract art, energy projects, mosaic animals, rescue vehicles, farm animals, model cars and clay creations were on display for parents and visitors to view and the students were eager to share what they had learned on each project. The students had researched, predicted outcomes, took measurements, analyzed, and used their imaginations to create the many displays which showcased some of their classroom projects. Visitors were also treated to a special ice cream social making the day a winning combination for all. 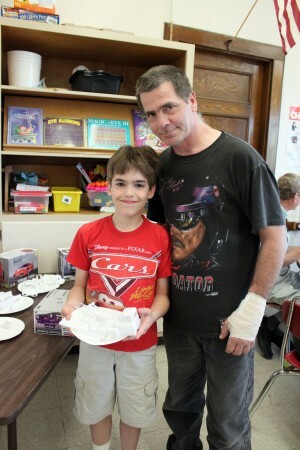 Mark Bagley, right, and his son, Mark Anthony Bagley II, pause for a photo during the Art, Science and Ice Cream Social held at Fourth Street School recently. Young Mark holds one of his favorite projects, still in progess - his model car.